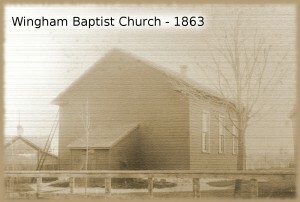 The year was 1863: the American Civil War was raging at its height in the south and Canada had not yet become a nation when Wingham Baptist Church was founded. A section of Upper Canada, designated as Huron County, had recently been surveyed and the town plot of Wingham had been divided into lots. The area was little more than a wilderness. Bears and wolves prowled freely. Into this uncultivated tract, ventured Edward Farley, the first settler. Coming by railroad from Owen Sound, he hired a wagon at Stratford for the rest of his journey. Unfortunately, his driver, discouraged by the poor conditions of the roads, deserted him in Blyth. He did however, manage to borrow a wagon and a team of oxen which enabled him to reach the hamlet of Bodmin in Morris Township. There he built himself a raft which carried him and his goods to the town plot, which is now Lower Wingham. Shortly after his arrival, Peter and Archibald Fisher and their families came to the area with the hope of buying the water rights in order to establish mills. After discovering they were for sale in Goderich, they made the trip there only to be outbid. However, as their competitor could not produce the required amount of money, the Fishers were able to purchase the rights for $1,200. In 1800, they built a needed dam and the following year established a saw mill, flour mill and a woolen factory. 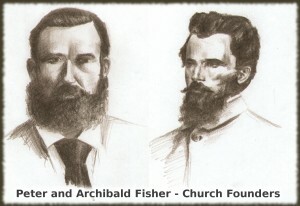 The Fishers were dedicated Christians who believed in Baptist principles. They held the area’s first prayer meeting in their home with about fifty in attendance. Later, services were held in a room above Jackson’s Store. The Maitland River was the setting for the first baptismal service and at this time, Archibald Fisher himself, was baptized along with two others. The congregation met faithfully, with the Baptist minister from Clinton, Rev. Dunlop, occasionally coming to encourage the little group. It didn’t take long for them to realize that a church must be built. In 1863, as they had industriously undertaken other projects, Archibald Fisher and his family turned their efforts into building a Baptist chapel. “It was moved by Peter Fisher and seconded by William Fairweather that the secretary write to the Bible Society in Toronto on behalf of the Sabbath School for a grant.” Reverend Fred Ratcliffe became the first minister in the same year. For twelve years, until 1875, the little band of believers met faithfully to worship in this church. The year 1875 was an eventful one for the Fishers. A destructive fire raged through the woolen mill. Women workers trapped on the second floor clung to windows until rescued. The fire spread to the grist mill which was destroyed and continued unchecked until it enveloped the house of Peter Fisher. In the same year, the church was sold for $300 to Lower Wingham to be used as a school. Interestingly, Mary Fisher, Archibald’s daughter became one of the first teachers in the school. She was employed for $325 a year. The town grew steadily – not in lower town where it was originally intended to be – but rather towards the east. And so it was decided that a new church should be erected in a more central location. Two lots consisting of two-fifths of an acre, on the corner of what is now Edward and John Streets were purchased for $550 from Peter Robertson who was also a member of the church. The men of the congregation set to work, labouring hard to build the new Baptist church for the glory of the Lord. Another series of special meetings were held in the year 1906. At this time, eleven young people from the Sunday School were led to Christ and later baptized. In August of 1912, Wingham was hit with a severe thunderstorm. Edward Street flooded and during the night rain and mud flowed into the church. Sunday morning worshippers were greeted with two floating organs, floating books and chairs. The Sunday School room was badly damaged, the books ruined and the organ damaged beyond repair. Less than a year later, in February 1913, the church furnace overheated and as a result, fire broke out. Firefighters were called and managed to put out the blaze, but not before the interior of the church was badly damaged. The new organ, purchased after the flood, was ruined and the piano in the basement received extensive water damage. Services were held in the Oddfellow’s Hall for several months while repairs were underway. New windows were installed in all of the building and the rest of the church was extended to make room for a new baptistry. The basement was completely refurnished and new seating accommodation installed in the auditorium. The repairs complete, the church reopened in June of 1913. In 1914, with the advent of World War I, the tranquility of the church was shattered. Several of the Wingham Baptist Church men, out of duty for their country, left church, home and family to fight in the war. Of those that went, four did not come back. 1929 witnessed the stock market crash, devastating lives and businesses. It was the time of the Great Depression and the church did not escape; it suffered with the rest of the nation. The minutes of 1930 show a deficit of $125. Various suggestions as to the method of making up the sum were discussed at a hastily called business meeting. Special offerings were taken and the pastor, W. E. Smith, was prepared to “lift the burden by seeking another church.” It was decided to write the Baptist Home Missions Board for a grant. The Mission Board had turned down the church’s request for funds earlier, but this time elected to help. Towards the end of the 1930s, the storm clouds of yet another war gathered ominously, and in 1939, war erupted. It was not long until 25 of the church’s men were called to duty. During each service, the congregation stood, and in prayer, remembered their men, many of whom were overseas. This time, all the enlisted men returned home safely. With the Great Depression and two wars behind, Wingham Baptist Church struggled on, trusting God for a more hopeful future. The 1940s afforded a unique opportunity for the church. Wingham’s radio station, CKNX, offered to allow the church to broadcast Saturday programs and some Sunday services, thus providing another means of proclaiming the Gospel. This ministry was to go on for over 50 years. 1946 brought about the decision to leave the Baptist Convention of Ontario and Quebec. A vote was held with delegates from the Convention present. Although the outcome was close, the vote was cast in favour of leaving the Convention. 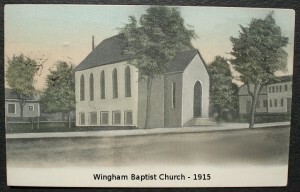 In April of 1947, Wingham Baptist Church joined the Fellowship of Evangelical Baptist Churches of Canada and remained a member until 1991 when the decision was made to withdraw and become independent. In more recent history, under the ministry of Pastor Ross Smith, an addition to the church was built as the congregation had outgrown its facilities. A bus ministry was started and continued for several years. In 1980 a Christian Day School was begun for the children of the church membership and continues to operate until this day. It has been almost 150 years since the little church first gathered to meet in Archibald Fisher’s home. Since that time much has changed – in Wingham, in Canada, in the world. But little has changed at Wingham Baptist Church. Today we still believe in and practice the “old-time” religion of our founders. We like to think that if those folk could somehow come to church today, they would feel right at home – with the same Bible version being used, the same old hymns being sung and the same gospel message being proclaimed. May it continue until Jesus comes. Ordination – The church has ordained six of its own pastors. Wives – Four of the young ladies of the church have become pastor’s wives. Baptism – Since the organization of the congregation in 1863, close to 600 people have been baptized. Membership – Sister’s Louise and Marie are the current longest-standing members, joining the church in 1930. Attendance – Under the bus ministry attendance reached 450. Ministers – In the church’s history, there have been 34 pastors, 2 assistant pastors and 1 youth pastor. Children – Pioneer Girls (1961-1976) and Christian Service Brigade (1970-1973) was held for children ages eight and up. Missions – The church has and/or does support missionaries in Israel, Nigeria, Senegal, Peru, Nicaragua and Moldova. auditorium lighting, sound system, church organs, Leslie tone cabinet, piano, sign above and painting behind the baptistry, tree, tables, chairs, film projector, pew slots, Bibles, and more.